Chantelle Brown-Young success as a model may come as a surprise since she is afflicted with vitiligo, an autoimmune disease in which the body attacks its own pigment-producing cells. Yet her mass appeal invites reflection upon the concepts of health, impairment and disability vis-à-vis perceptions of beauty. Her international success notwithstanding, Brown-Young finds it imperative to help others appreciate beauty in its various forms. During her first appearance on America's Next Top Model, she imploringly asks "How can I show you the beauty in differences?" Chantelle Brown-Young is a black Torontonian model whose appearance on America's Next Top Model has propelled her to global fame. Her success may come as a surprise since Brown-Young is afflicted with vitiligo, an autoimmune disease in which the body attacks its own pigment-producing cells. The distribution of her lesions is largely symmetrical, involving her mid-face, around her mouth, abdomen, upper thighs, knees and ankles. Brown-Young's mass appeal invites reflection upon the concepts of health, impairment and disability vis-à-vis perceptions of beauty. Some individuals with vitiligo are uncomfortable with the phrase "suffering" as it relates to their condition. However, in the medical arena, anyone who has a disease is, by definition, said to suffer from it. Unlike the term disease, the concept of disability is less precise. The World Health Organization considers disability an umbrella term "covering impairments, activity limitations, and participation restrictions." An impairment is a problem in body function or structure; an activity limitation is a difficulty encountered by an individual in executing a task or actions. Brown-Young may therefore have less activity limitation and therefore a different disability overall than many with identical disease. Since many societies have placed aesthetic value upon symmetry throughout human history, the symmetric nature of Brown-Young's vitiligo decreases her disability -- a relationship moderated by the subjective aesthetic preferences of modelling agencies and the general public. Indeed, vitiligo, like many other skin conditions, can cause significant psychosocial impairment among sufferers. Brown-Young seems to have taken her (dis)ability into her own hands. Last September, she shared with The Sydney Morning Herald her resolve, starting from a young age: "I just decided I'm going to tell myself that I am beautiful and this is how I may be for the rest of my life." Psychological distress caused by pigmentation disorders including vitiligo is an important consideration, especially for certain populations. In India, where leprosy is common, many people with vitiligo are shunned and seen as outcasts; treated like lepers because leprosy can present as light patches on the skin similarly to vitiligo. Furthermore, as many people of color link skin color as a part of their identity, a sense of belonging to their communities and their heritage may be threatened by pigmentary disorders. Indeed, many vitiligo patients would not praise it as "symmetrical fantasticness [sic]" as espoused by Tyra Banks during Brown-Young's first appearance on America's Next Top Model. Many dermatologists, plastic surgeons and other medical professions in the ever-growing field of aesthetic medicine are developing and performing new procedures to help to alleviate signs of aging. In this sense, people are now said to be "suffering" from natural aging. In a world that has historically valued youth and beauty, particularly in women, cosmetic interventions are becoming more mainstream and more accepted, with less stigma. In many parts of East Asia, the prevalence of skin-lightening products and cosmetic procedures is much higher than it was just a few decades ago. In South Korea, it is common for young women to seek surgical "correction" of their eyelids to approximate the appearance of individuals of European descent. Blepharoplasty in Korea enjoys a similar level of social acceptability as providing orthodontics to youth in North America and Europe. In a recently-aired feature on National Public Radio (NPR), entitled Is Beauty In The Eye(Lid) Of The Beholder? journalist Karen Chow investigates cosmetic blepharoplasty surgery in Korea to "correct" single eyelids to form double eyelids in order to approximate an Anglo-European standard of beauty. The origins of cosmetic blepharoplasty can be traced to 1895 in Japan while the first reported procedure in North America in 1926 saw a Japanese man go under the knife. Blepharoplasty comprised over six percent of plastic surgery performed upon Americans of Asian extraction in 2013. In fact, this figure may underestimate the true proportion as it does not account for procedures performed overseas or by non-certified surgeons. The history of cosmetic surgery to approximate the appearance of those of European descent is by no means limited to those of East Asian descent. Makers of skin-lightening and hair straightening products have targeted the African Diaspora for some time. As I described in my previous publication about ethnic-specific cosmetic surgery among African Americans, some 20th century plastic surgeons felt that they were increasing the social and economic opportunities available to African Americans (especially those of mixed race whose resultant "less ethnic" appearance would prove beneficial for television appearances and during face-to-face business transactions) by providing rhinoplasty to approximate the European standard of beauty. One of the "responsive professionals" fulfilling this role was American plastic surgeon Jacques Maliniak, who maintained that "the nose has strong and discernible racial characteristics. In an alien environment, these may be highly detrimental to its possessor. A negroid nose is a distinct social and economic handicap." In advocating skin cancer prevention to the public, dermatologists have taken advantage of society's lionization of youth and beauty. Many young people receive excess recreational ultraviolet exposure from indoor and outdoor tanning. In addition to stating that adhering to sun safe practices will decrease the risk of skin cancer, public health messages aimed at youth emphasize that recreational ultraviolet exposure accelerates the development of wrinkles, unsightly pigment spots, and other signs of aging skin. Brown-Young is an empowering voice for those diagnosed with vitiligo. In a world that espouses an ever-increasing armamentarium of aesthetic treatments and procedures, her stance is refreshing. 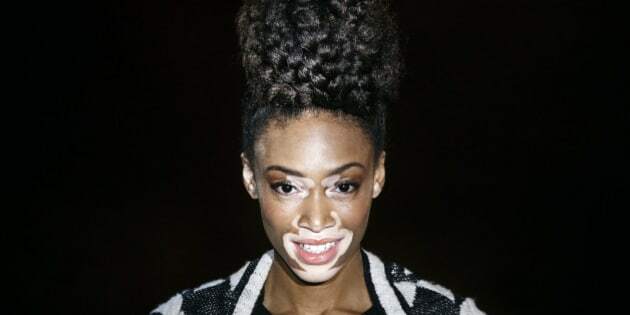 Brown-Young's attitude is evidenced by a YouTube video about her vitiligo, in which she proclaims that "God chose me to be original...I'm me." It seems appropriate that she refers to herself as an "underdog" in this age with the medicalization of aging and increasing emphasis on the ability to "correct" appearances. Brown-Young remains a testament to, and a sign of hope for, the acceptance of the natural beauty of all women. Her international success notwithstanding, Brown-Young finds it imperative to help others appreciate beauty in its various forms. During her first appearance on America's Next Top Model, she imploringly asks "How can I show you the beauty in differences?"